Author Simone Elkeles’ new book is set in the same fictional Chicago suburbs as her highly successful Perfect Chemistry romance trilogy. In those books, Ms. Elkeles wrote a potent setting for her star-crossed teenagers, mixing middle class prejudice, ethnic segregation, and gang violence. Those real life pressures delivered an intense, challenging backdrop for the love-to-hate romance trope that the author writes so well. In Wild Cards the theme switches from drug gang violence to all things football. But without the life and death stakes of her earlier tales, the love-to-hate trope stumbles a bit. The pages turn themselves anyway, because the premise is fresh, and both main characters are easy to love. Derek Fitzpatrick may still be mourning his mother’s death, but he’s a good friend and a good stepbrother. Even dogs love him. He’s also a serious hunk with beautiful blue eyes. Ashtyn Parker is the only female member of her high school football team. Yet off the field she’s all girl and has already won over the boys on her team (except for her own boyfriend). She’s elected captain of the team. In short, the hero and heroine of the story are just about perfect—and perfect for each other. And therein lies the problem. The characters in the previous series were bound by serious worldly problems and impossible decisions. In the Perfect Chemistry books tremendous personal growth was required before a happily ever after could be attained. In Wild Cards that isn’t quite the case. The result is a plot dependent on much more coincidence and device. That’s not to say that the characters in Wild Cards have no barriers to leap. Ashtyn wants a football scholarship. But first she needs to regain her father’s love and find a way to fit in to her changing family. Derek needs to advance the mourning process and move on to acceptance. Unfortunately, some outlandish plot and scenery help to affect these transformations, including a conveniently improbable road trip, a grandmother straight out of Dallas reruns, football glitz, nightclub brawls, and the revelation that one character is secretly the heir to an industrial fortune. The story is told in alternating first person narratives for a youthful, confessional tone. 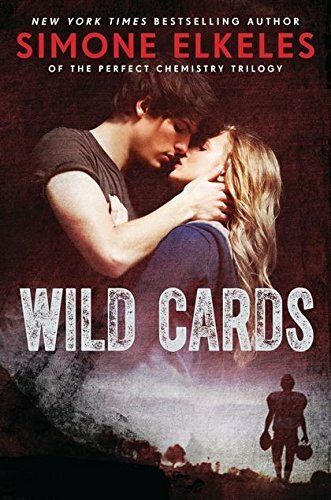 In Wild Cards both the premise and the hero are irresistible. One of Ms. Elkeles’ strengths is that she writes guy voices that are credible and fun. Derek’s banter will not disappoint the author’s fan base.